we design and fabricated process Reactors to match the optimum process conditions of tempreture and pressure with efficiant mixing application. We manufacture & export Process reactors used in Solvent process and fusion process for making Alkyd, UF, MF, and Phenolic Resins. 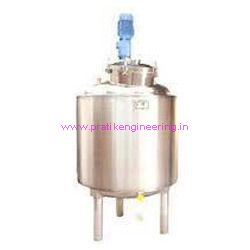 Established in the year 2001, we “Pratik Engineering” are trustworthy manufacturer and supplier of a wide assortment of Chemical Plant Equipment. In our product range we are providing a wide variety of superior quality Chemicals Equipments, Chemical Reactor and Stainless Steel Storage Tank that have earned us ISO 9001: 2008 certifications. We are offering this product array that has been developed by making use of the supreme quality components. Offered with the features like efficient output, precision engineering, sturdy construction, excellent functionality and high durability, our product range have gained huge appreciation by patrons. Our offered range is used in various chemical and manufacturing industries. Customers can avail these products from us in the most comprehensive prices. We manufacture these chemical plant equipment at our well-equipped infrastructure, backed by the upgraded and modern machines. We believe that to become clients’ preferred option what is most required is a client-specific approach and inspired by these working strategies, we have reached so far in this domain. Products that we are offering are fabricated in compliance the approved industry norms and are designed as per the prevailing market trends, to meet the varied needs of the clients.We have huge clients across the globe. Some of them are Abhinandan Rasayan Pvt. Ltd., Taloja, Heramb Oil Corporation, Dombiwali, Durvesh Rasayan Pvt. Ltd. Taloja and Spectrum Ethers Ltd., Nasik. Moreover, we are exporting these products in UAE.